The Cornfed SIP User Agent CLI client provides a flexible and scriptable capability for controlling voice calls. The CLI has been designed specifically to work with the Expect scripting langage. 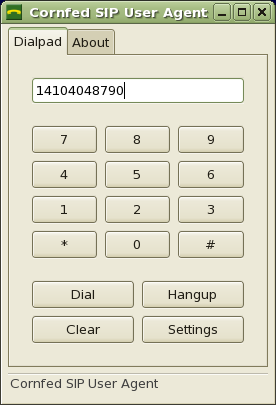 The Cornfed SIP User Agent Gnome/GTK GUI client provides a basic softphone capability for Gnome desktop environments.